A brand-new set of phonics readers from Ladybird - perfect for helping your child with their phonics learning at school. Ladybird I'm Ready for Phonics readers uses simple language and engaging, humorous stories to help children develop their phonics skills. The series has been carefully written to give gradual, structured practice of the synthetic phonics your child is learning at school. 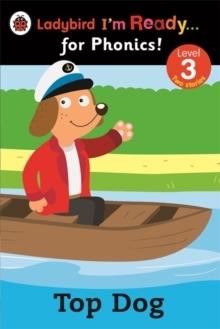 The books introduce phonemes in a similar order to the way they are taught in most UK schools and also provide practice of common tricky words, such as the and said, that cannot be sounded out. Level 3 teaches sounds: m d g o c k ck. The series closely follows the order that a child is taught phonics in school, from initial letter sounds to key phonemes and beyond. It helps to build reading confidence through practice of these phonics building blocks, and reinforces school learning in a fun way. With simple vocabulary and subtle comprehension cues, these phonic readers will encourage, motivate and ignite children's excitement about reading. Other titles in the series are: Phoneme Flash cards: Ladybird I'm Ready for Phonics, Say the Sounds: Ladybird I'm Ready for Phonics, Captain Comet's Space Party! Ladybird I'm Ready for Phonics: Level 1, Nat Naps! : Ladybird I'm Ready for Phonics: Level 2, Huff! Puff! Run! Ladybird I'm Ready for Phonics: Level 4, Fix It Vets: Ladybird I'm Ready for Phonics: Level 5, Dash is Fab!